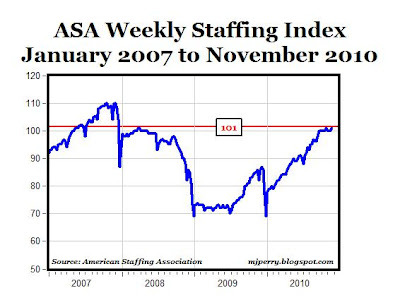 "During the week of Nov. 15–21, 2010, temporary and contract employment rose 0.87%, raising the ASA Staffing Index up one point to a value of 101. 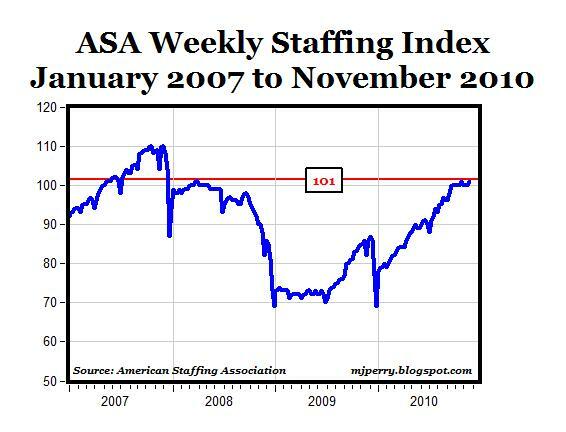 At a current index value of 101, U.S. staffing employment is 46% higher than the level reported for the first week of the current year and is 17% (23%) higher than the same weekly period in 2009 (2008)." MP: The weekly staffing index of temporary and freelance employment has now been at a level of 100 or higher for the last ten weeks for the first time since the spring of 2008, more than two and a half years ago. Further, the 101 index reading for the Week 47 matches the same index level for two weeks in March 2008, and reflects the strongest demand for contract, freelance and temporary employment since an index reading of 104 in December 2007. As a leading indicator of nonfarm employment, the ongoing improvements in the nation's key barometer of the demand for temporary and freelance workers signal future gains in permanent employment opportunities. 1. U.S. staffing companies employed an average of 2.6 million temporary and contract workers per day from July through September. This is 24.9% more staffing employees per day than in the same quarter last year and an increase of 8.1% in average daily staffing employment over this year's second quarter. 2. The year-to-year percentage increases in employment in this year's second and third quarters are comparable to the industry's job growth rates in the early 1990s—and the strongest since. 3. "During the past 12 months, staffing firms have added over a half million new jobs to the economy," says ASA president and chief executive officer Richard Wahlquist. "Demand for temporary and contract help is expected to remain strong as businesses turn to flexible work force solutions to help them improve efficiency and productivity while adjusting to changing economic conditions." Online Job Openings Reach 27-Month High in Oct. Shocking Video Evidence of "Consumer Greed"